State vs. Alberto Lopez, burglary, instructed verdict of not guilty. State vs. Geranimo Campe, Fernandez, Carlos Moreno, burglary and theft over $50, on trial. 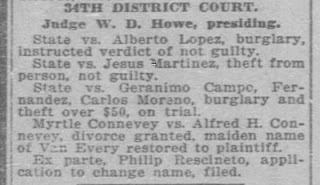 Myrtle Connevey vs. Alfred H. Connevey, divorce granted, maiden name of Van Every restored to plaintiff. Ex parte, Philip Rescineto, application to change name, filed. 1) Before Thursday I had three husbands for my grandmother Myrtle Van Every. Jack (1919), Dale Ridgely (1927), and my grandfather (1936-). While I still have yet to identify Jack's surname, I am pretty sure Jack is not a nickname for Alfred. The letters from Myrtle's parents consoling her on her divorce from Jack were sent in the summer of 1919. Her divorce from Alfred occurred in February of 1920. So it seems Myrtle married two men the year she was 19, neither marriage lasting long. 2) Is it possible this is a different Myrtle Van Every? There are other Myrtle Van Everys. My grandmother was named after her aunt, for one. However, Myrtle Connevey appears in the 1920 census, taken in January. This Myrtle Connevey appears within the list of soldiers stationed at the QuarterMasterCorps at Fort Bliss in Texas. She was 19 years old, and a typist in an office. All these facts match what I know of my grandmother. I found this record back in 2007 when I began researching, but I figured if it was my grandmother, the handwriting was sloppy enough it might actually read 'Van Every' and somehow she got recorded as a 'wife' instead of 'single' as there was no husband listed with her. 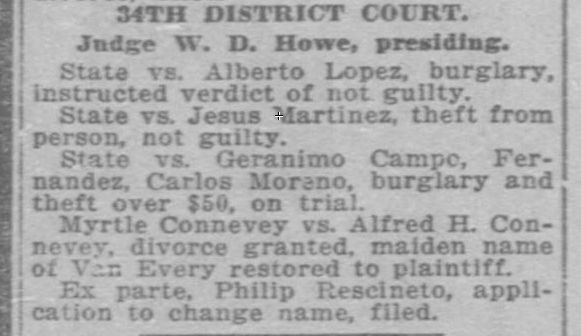 Alfred Connevey is actually recorded as a lodger living somewhere else in El Paso. My guess is the two of them were already separated, but the divorce hadn't yet been settled. 3) I have already contacted the El Paso District Clerk's office to request copies. I should know by the end of the week whether or not the records exist.